Sky’s Chris Froome looks forward to 2015 after a “tough” 2014 season that included losing the Vuelta a España to Alberto Contador (Tinkoff-Saxo) and seeing Vincenzo Nibali (Astana) win the Tour de France. Froome arrived in Leon, Spain, on Friday to speak with the press ahead of the Ponferrada World Championships – his last race of 2014. Two weeks ago in the same area of northwest Spain, he placed second overall to Contador in the Vuelta a España by 1-10 minutes. It was Froome’s second grand tour without the same success that Sky is accustomed to. He crashed three times in the Tour de France and abandoned with broken bones in his wrist and hand. Even with several early season wins – Oman and Romandie – the Tour abandoned highlighted a rocky season that included crashes in the Critérium du Dauphiné (1) and the Vuelta (2), and back problems. 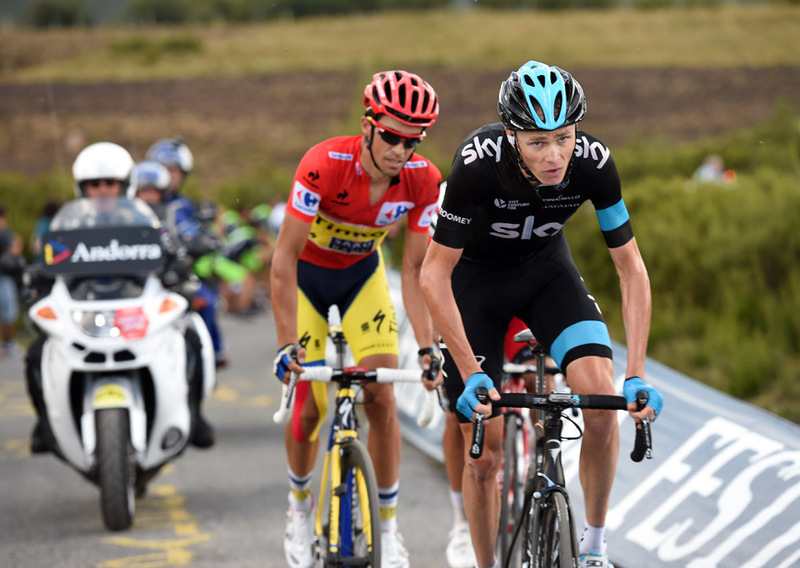 Froome also had a good look at the rivals he will likely face at the 2015 Tour de France. On television, he saw Italy’s Nibali ride clear of his rivals with both him and Contador away with fractures. He dismissed the idea that Nibali won thanks to the lack of rivals. “You can’t go back and say that, that’s doesn’t make sense and it’s not how cycling works. He won this Tour outright. I don’t think it’s right to go back and say that he wouldn’t have won if so and so wasn’t there,” Froome explained. At the Vuelta, Froome saw Contador back to the best he has been since his doping suspension in 2011 and 2012. Contador also had to abandon the Tour, but came back for his home race stronger than Froome and sent a warning to team Sky. “You always have different rivals, but Contador is really hard to face. One asset is my strength in the time trial, so I’m quite eager to see the 2015 Tour route, and if there is going to be more time trials then I want to use that to my advantage.